Typhoon Ruby (Hagupit) made landfall Saturday night lashing parts of the Visayas with strong winds and heavy rains. Led by TJ Manotoc, ABS-CBN News Channel aired a special edition of ANC Breaking, while also airing a replay of Saturday's The World Tonight with Gigi Grande. On 9TV, Pia Hontiveros anchored a special broadcast, with reports from the likes of Miguel Ortilla, David Santos and Tricia Terada — all deployed in key locations down south. People still wide awake. 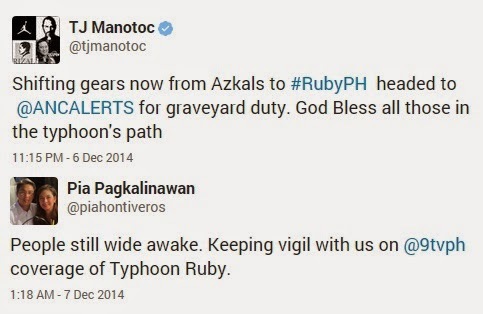 Keeping vigil with us on @9tvph coverage of Typhoon Ruby. The network which will be renamed CNN Philippines come January, also heavily relied on CNN International's reportage, mostly with weather reports from meteorologist Ivan Cabrera. Could that be a hint of what's to come next month? Maybe yes, or maybe not. To a more important question: Why didn't the other networks preempt their programming — home shopping in the case of TV5 — to cover an important story?